An exceptionally haunting memoir that also shows us what it is to be really human. In a hardware store, Joe sits on a display toilet amidst the throng of customers and wees, smiling serenely. He thumps crying babies. He is amazed when the car he runs in front of actually hits him. He’s funny, fascinating and maddening. Joe is ten and mentally disabled. 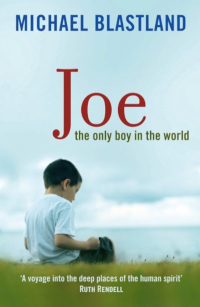 This memoir tells his moving story, but also argues that until we know Joe’s life, we can’t understand our own. Through philosophy, psychology and medical research, the author explains how we are mind-readers, how we make sense of other people and how we understand guilt and innocence, and shows that Joe sets our humanity in sharp relief. But in that case, is Joe part of it? The author who asks that outrageous question is Joe’s father. First published by Profile Books in 2006. “From this careful, serious book emerges a man with a quick wit and a far-seeing eye for what makes life so peculiar… (Joe) stands out as a work of rare enlightenment”. Bernard Rimland, founder of the Autism Society of America, technical consultant for Rain Man. “Deeply personal and moving. Blastland’s beautifully written book offers us a glimpse of the torments endured by the growing number of children born with their cerebral pathways wrongly wired”.